These are the primary core beliefs of Calvary Christian Church:. We believe that all scriptures, both the Old and New Testaments, are inspired by God. They are revelation of God to man. They are the infallible, inerrant, and authoritative rule of faith, conduct, and doctrine upon which we base our lives and beliefs. (2 Tim. 3:15-17; 1 Thess. 2:13; 2 Peter 1:21). We believe that God is 3-in1. That the one true God has revealed Himself as the eternally self-existent "I AM", the Creator of heaven and earth and the Redeemer of mankind. He has further revealed Himself as embodying the relationship and association as Father, Son and Holy Spirit. (Deut. 6:4; Isa. 43:10,11; Matt. 28:19; Luke 3:22). His virgin birth (Matt. 1:23; Luke 1:31,35). His sinless life (Heb. 7:26; 1 Peter 2:22). His saving work on the cross (1 Cor. 15:3; 2 Cor 5:21). His bodily resurrection from the dead (Matt 28:6; Luke 24:39; 1Cor 5:21). His exaltation to the right hand of God (Acts 1:9,11; 2:33; Phil. 2:9-11; Heb. 1-3). We believe that heaven and hell are both a very real places. We believe that God does not want or desire any person to perish in hell. Rather He desires all men everywhere to be saved, and He has prepared heaven for those who choose Him and His free gift of salvation. On the contrast He has prepared the eternal lake of fire for the devil and his angels. Those who choose to live in rebellion to God and do not accept the gift of His son and salvation through Him will be judged and condemned to go there as well. (Rev 20:14-15) We believe that there is only one way to God and that is through His Son Jesus Christ. All other ways are man's attempts to make God in their image, and will not hold up under the scrutiny of God in the day of judgment. Man was created good and upright, for God said, "Let us make man in our image, after our likeness." However, man by voluntary transgression fell and incurred physical death and spiritual death, which is separation from God. (Gen. 1:26,27; 2:17,3:6; Rom. 5:12-19). Man is justified and saved only through belief in the Lord Jesus Christ. (John 14:6, Acts 4:12, 1 Tim 2:5, Rom 10:9,) Man's only hope of redemption is through the blood of Jesus Christ, believing unto Him for salvation, living a life of submission to Christ, and having a life that bears the mark and fruit of a person who is a "Christ Follower" or "Christian". Salvation is received through repentance to God and faith in the Lord Jesus Christ. Acknowledgment that you are a sinner and without hope, or power to save yourself from the destruction of hell. The washing of regeneration and renewing of the Holy Ghost, being justified by grace through faith, man becomes an heir of God according to the hope or eternal life (Luke 24:47; John 3:3; Rom. 10:13-15; Eph. 2:8; Titus 2:11; 3:5-7). The inward evidence of salvation is the direct witness of the Spirit (Rom. 8:16). The outward evidence to all men is a life of righteousness, true holiness, as well as a life that bears the fruit and works of the Lord. According to James faith without works is dead, and a true believer will not only profess their faith, but live a life that bears this out. (Eph. 4:24; Titus 2:12) This is not to say that a Christian never sins or fails, but rather when he does he is convicted by his sin, repents to the Lord, trusts in His forgiveness, and endeavors, by the power of the Holy Spirit, to change the areas of his life that need it. The life and attitude of a believer should be one of humility, a desire for more of the Lord, and less of the world, flesh, and sin. At the end of the age God will build a new heaven and earth. "We, according to His promise, look for new heavens and a new earth, wherein dwells righteousness" (2Peter 3:13, Rev 21,22). To evangelize the world (Acts 1:8; Matt 28:19,20; Mark 16:15,16). A divinely called and Scripturally ordained ministry has been provided by our Lord for the purpose of leading the Church in: (1) Evangelizing the world (Mark 16:15-20), (2) Worshipping of God (John 4:23-24), (3) Building a body of saints conformed to the image of Jesus (Eph 4:11-16), (4) Equipping and maturing the saints. 1 Cor 11:29 shows the importance of discerning the Lord's body. We believe that fellowship with other Christians, regardless of denomination, is of utmost importance. That putting aside minor differences of opinion, we must love one another in the bond of unity and peace. (Eph 4:3) We at Calvary Christian Church seek to fellowship with outside churches, various assemblies, and other believers within the faith. We believe that a vital part of a local church is the support of the missionaries and the mission field. (Acts 1:8, Matt 28:19-20) Although not all can be sent, all can participate in the support of those who are sent. Calvary Christian Church is privileged to support a variety of mission endeavors throughout different parts of the world. The husband and wife are of equal worth before God, since both are created in God's image. A husband is to love his wife, and lay down his life for her as Christ loved the church. He has the God-given responsibility to provide for, protect and lead his family. A wife is to submit herself graciously to the servant leadership of her husband even as the church willingly submits to the headship of Christ. She, being in the image of God, as is her husband, and thus equal to him, has the God-given responsibility to respect her husband and to serve as his companion in managing the household and nurturing the next generation. We understand that there are different interpretations with regards to some of these positions, and we do not desire to be divisive over these issues. However, they are beliefs and principles that we adhere to as church and they are an integral part of who we are and part of the vision and direction we have as a church body. Although we wholeheartedly believe that tithing is an act of obedience to the Lord, we do not pass an offering plate at Calvary Christian Church. One reason is that it gives way to the belief that church is all about money. We do not want to "guilt" people into giving to the Lord with their tithe in offering. We believe that the Lord will always provide regardless. While we believe that how we handle our money and our obedience to the Lord in tithing and offering is very important, we feel that money itself is one of the least important things to God. Another reason we do not pass an offering plate because it tends to interfere with the spiritual flow of the service. When worship has opened the hearts of God's people to hear His Word, we don't want to interrupt that process. The New Testament supports this method in Mark 12:41 where it is recorded, "Now Jesus sat opposite the treasury and saw how the people put money into the treasury." It is also supported in 2 Kings 12:9 "Then Jehoiada the priest took a chest and bored a hole in the lid of it and set it beside the altar on the right side as one entered the house of the LORD. And the priests who guarded the threshold put in it all the money that was brought into the house of the LORD." We do make an offering basket available for the purpose of worshiping the Lord with tithes and offerings, but want believers to give out of an obedient and cheerful heart to the Lord, not out of pressure from the church. Click Here for an article on the tithe box. Calvary Christian Church believes that the Bible is the final authority on all matters of faith and conduct. (2 Tim 3:16) Praise and worship are an important part of our services because we believe that as the scripture says, we "enter into his gates with thanksgiving, and into his courts with praise" (Psalm 100:4), and that the Lord "is enthroned in the praises of Israel" (Psalm 22:3). We believe biblicaly based worship serves to both honor God and to prepare our hearts to receive the preaching of the word. Calvary Christian Church believes that "God is Spirit, and those who worship Him must worship in spirit and truth." (John 4:24) We believe that the Bible is the infallible revelation of God's ways to mankind. Therefore, if we are to worship in spirit and in truth, we must pattern our worship after the Scriptures and not after our personal traditions, desires, or what makes us feel comfortable. It is possible that our worship service will be different and unique to many other services you have attended. It is not our intention to make you feel uncomfortable during our worship service. However our greatest desire is to make the presence of God comfortable, and to have our service be a place where the Lord meets with us through worship. As the bible so often bears out, most often times the ways of the spirit are opposed to the ways and desires of our flesh. (Gal 5:17) So it is with worship. Biblicaly based worship will often grate on our flesh, but it is glorifying to God. Furthermore, it always a good thing to have an opportunity to subjugate our flesh as we build up our spirit! We hope that you will give our service a chance to see if you experience a greater anointing and presence of God than more traditional or contemporary services you may have previously been a part of in the past. Our purpose in presenting this belief is to identify the Biblical basis and standpoints for why we do, what we do. While we feel it is very important to have a time of inward heart reflection, we also believe that it is also important to have a time of outward expression in thanksgiving and rejoicing. Just as there are two sides to a stream, or two wings to a dove, so are there 2 parts to our song service. The first half is made up of faster songs that are rejoicing or triumphant in nature, and the second half is comprised of slower songs that are more reflective or awe inspiring in nature. We believe that worship should involve all three and not only the one or two that may suit us. This Link is an excellent break down as to what this means. Here at Calvary we are fully convinced that the scripture bears out that we are not to be mere spectators when we meet together for corporate worship, but active participants in our offerings of praise. Most folks have no reservations about outward displays of praise at a sporting event such as a football game, basketball game, etc, but when it comes to praise for the savior, so often times we become extremely reserved. Our services are not "contemporary" in the modern sense of the word nor are they "conservative" in the traditional sense. What our services are: Vibrant and Exuberant! 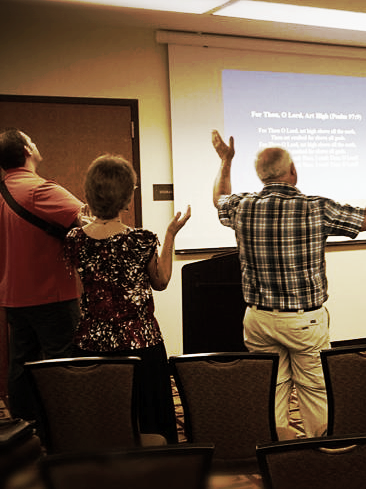 We are certainly not a "holy roller" church, but we do believe in worshiping the Lord with our "whole heart". Why Do We Clap Our Hands and Sing Loudly? The Scripture clearly teaches that the clapping of our hands is an expression of worship to our great God and King. The Bible also commands it in Psalm 47:1 "Clap your hands, all peoples! Shout to God with loud songs of joy!" Clapping our hands is a universal expression of praise and joy. It is used extensively to express adulation, appreciation, praise, delight, approval, recognition and joy. We display it in everything from concerts to basketball games. We believe that if there is a valid reason for clapping, it is because we want to honor our Lord and Savior, Jesus Christ, through obedience to His Word. We are told in Psalm 32:11 "Be glad in the Lord and rejoice, you righteous; And shout for joy, all you upright in heart!" While we want folks to feel the freedom to quietly reflect on the goodness of the Lord we are also told in Psalm 98:4 "Make a joyful noise unto the LORD, all the earth: make a loud noise, and rejoice, and sing praise." The Apostle Paul said, "I will therefore that men pray everywhere, lifting up holy hands, without wrath and doubting." (1 Timothy 2:8) The lifting of hands expresses various things. It reveals hunger and desire for the Lord; "I stretch forth my hands unto thee: my soul thirsts after thee, as a thirsty land." (Psalm 143:6) It is an act of worship as well as a command, "Lift up your hands in the sanctuary, and bless the Lord." (Psalm 134:2) It is a universal expression of surrender. Also, like clapping, it is used throughout public gatherings to express joy, praise, adulation, approval and delight. Whatever it may mean to each individual as they lift their hands, it is an expression of worship that is commanded in the Old and admonished in the New Testament. Why Is There Such an Emphasis on Worship? We emphasize singing and worship because it delights the Lord and causes His Presence to draw near. As we praise the Lord our hearts are prepared to hear His word. Worship is not a spectator activity, but an activity that all should collectively participate in. Psalm 69:30-32 (NKJV) says, "I will praise the name of God with a song, and will magnify Him with thanksgiving. This also shall please the Lord...The humble shall see this and be glad." Psalm 22:3 in the King James Version declares, "But thou art holy, O thou that inhabits the praises of Israel." The New King James Version renders this verse, "But You are holy, Enthroned in the praises of Israel." Psalm 47:6-7 (NKJV) commands us, "Sing praises to God, sing praises! Sing praises to our King, sing praises! For God is the King of all the earth; Sing praises with understanding." What Are the Different Kinds of Songs That are Sung? Paul tells us in Ephesians 5:19 (NKJV) "Speaking to one another in psalms and hymns and spiritual songs, singing and making melody in your heart to the Lord." Colossians 3:16 says, "Let the word of Christ dwell in you richly in all wisdom, teaching and admonishing one another in psalms and hymns and spiritual songs, singing with grace in your hearts to the Lord." We practice all three types of singing that are mentioned in these verses. Psalms - Psalms are verses directly from the Scriptures. The Psalms were the songbook for Israel and have always been sung by God's people throughout history. Many of the songs sung in our service are often times direct quotes from the psalms. Hymns - Hymns are songs written by godly people. They are not divinely inspired as the Scriptures are but have been recognized as anointed by the Holy Spirit, and are therefore spiritually edifying. Jesus sang hymns with His disciples according to Matthew 26:30. Spiritual Songs - The third type of singing mentioned is spiritual songs. There are many spiritual and godly songs written by different people throughout the years that have proven to be anointed in nature. We incorporate a wide variety of these into our worship service. We do not believe that all men will be saved (sometimes known as the doctrine of the restoration of all things), but we do believe that the gift has been made available to "whosoever wills" (Rev 22:18) We believe that God in His eternal foreknowledge knows those who will or will not accept the gift of Jesus Christ, but that all men have still been given the freedom and opportunity to choose whether or not they accept the gift of salvation. Our doctrinal belief is that Jesus Christ died on the cross for the sins of the whole world and that His sacrifice has been made available and offered to everyone, and it is their choice to accept it or reject it. John 3:16 "For God so loved the world that He gave His only begotten Son, that whosoever believes in Him should not perish but have everlasting life." 1 Tim 2:3,4 "For this is good and acceptable in the sight of God our Savior, 4 who desires all men to be saved and to come to the knowledge of the truth." 1 Tim 4:10 "we have our hope set on the living God, who is the Savior of all people, especially of those who believe." Titus 2:11 "For the grace of God that brings salvation has appeared to all men"
Heb 2:9 "But we see Jesus, who was made a little lower than the angels for the suffering of death, crowned with glory and honor; that he by the grace of God should taste death for every man." 2 Peter 3:9 "The Lord is not slack concerning his promise, as some men count slackness; but is long-suffering toward us, not willing that any should perish, but that all should come to repentance." Acts 17:30 'And the times of this ignorance God overlooked; but now commands all men everywhere to repent"
We believe in obeying the command of the Lord through James when he says, "Is anyone among you sick? Let him call for the elders of the church, and let them pray over him, anointing him with oil in the name of the Lord." (James 5:14) We believe our Lord the "Great Physician" hears and answers these prayers in His perfect and sovereign way. We do not want to proverbially "throw out the baby with the bath water". While we realize that in many circles claims of healings and gifts are often abused and are many times falsely purported to be happening, we also believe that divine healing and the gifts of the Holy Spirit are still available to the children of God today. Divine healing is an integral part of the gospel, and the scripture goes to great lengths in detailing these miracles. Deliverance from sickness is provided for in the atonement and is the privilege of all believers based on: Isa 53:4-5, Matt 8:16-17, James 5:14-16. With this said, we do not ascribe to the "word of faith" or "name it and claim it" movement. Although we believe that faith is an integral part in receiving a touch, we also recognize that the Lord does not always choose to give divine healing. We believe that He wants us to trust Him and pray for healing but that it is ultimately up to Him whether or not we receive it. It is not dependent on our amount of faith or lack thereof. We hold to the position that the gifts such as tongues and prophesy are still available and in use today, but pertaining to these gifts all things must be "done decently, and in order". (1Cor 14:40) Today much of what is seen and practiced in these gifts can be attributed to human emotion, and is certainly not done "decently and in order". However, we do not ascribe to the belief and interpretation that these gifts have completely ceased to exist. 1 Cor 12:7-11 "There are diversities of gifts, but the same Spirit. 5 There are differences of ministries, but the same Lord. 6 And there are diversities of activities, but it is the same God who works all in all. 7 But the manifestation of the Spirit is given to each one for the profit of all: 8 for to one is given the word of wisdom through the Spirit, to another the word of knowledge through the same Spirit, 9 to another faith by the same Spirit, to another gifts of healings by the same[b] Spirit, 10 to another the working of miracles, to another prophecy, to another discerning of spirits, to another different kinds of tongues, to another the interpretation of tongues. 11 But one and the same Spirit works all these things, distributing to each one individually as He wills." 1 Cor 14:1 "14 Pursue love, and desire spiritual gifts, but especially that you may prophesy"
1 Cor 14:39 "Therefore, brethren, desire earnestly to prophesy, and do not forbid to speak with tongues. 40 Let all things be done decently and in order." Rev 19:10 "the testimony of Jesus is the spirit of prophecy." We also believe that there are many different gifting's as found in Rom 12:6-8, 1 Cor 12:4-11, 28. These can include: Serving, Teaching, Encouraging, Giving, Leading, Mercy, Words of Wisdom and Knowledge, Discerning, Helping, and Faith.